A light wave traveling through an medium with an index of refraction n1 is incident on the surface of a second medium with an index of refraction n2. Some of the light is reflected and some is transmitted into the second medium. The interface is at z = 0, as shown in Figure 1. Let's use the magnetic field intensity H instead of the magnetic flux density B. Recall that H is proportional to the magnetic flux density B.
is the characteristic impedance of the medium. The electric field is the sum of a wave traveling in the positive z direction and a wave traveling in the negative z direction. The magnetic field also consists of waves traveling in the positive and negative directions. Since the interface is at z = 0 and l is the distance from the interface, in medium 1. Changing variables, writing Equations 4 and 5 in terms of the distance from the interface, letting z = -l.
Recall that the cross product of E and H (E X H) is in the direction of propagation. This results in the minus sign in Equation 10.
where Hl is the magnetic field at the interface. Subtracting Equation 14 from Equation 12.
where the subscript "1" refers to the fields at the interface between medium 1 and medium 2. Subscript "2" refers to the interface between medium 2 and medium 3. For the case where the thickness of medium 2 is a quarter wave length. This results in the following transfer matrix equation. 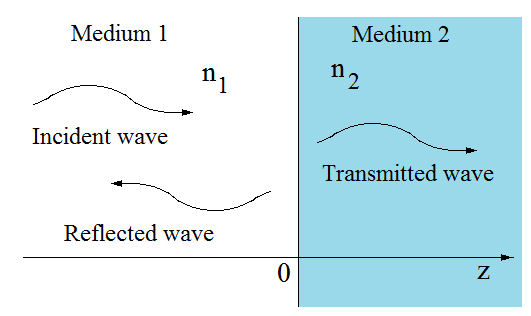 where Z1 is the characteristic impedance of medium 1.